It’s that time of year again, the time of year when our attention is dragged, possibly kicking and screaming, into the commercial frenzy that has become Christmas. In truth there are some that go joyfully into the fray enjoying the cut and thrust of present buying, decorating the house and buying so much food they could feed a whole village for a month, whilst others cringe at the mention of the word Christmas and want to run and hide until it is all over. Then there are some that yearn for a more gentle focus on the true nature of this festive time, the winter solstice. My feelings are ambivalent, I swing between enjoying the idea of good food and family and wanting to focus quietly on the winter solstice and the seeds of rebirth that lie dormant, awaiting the light and warmth of a new growing season. What ever anyone’s beliefs are, this time of year has always been an important time of celebration. Human beings need something to sustain them through the darkest times, whether that is a psychological or physical darkness, and winter can be most difficult even in a pampered western environment. The solstice has been and will always been a bright focus to lift the spirits and bring people together. Back in the days when our lives, here in Britain, depended on a successful harvest, the return of light was fervently prayed for so the growing cycle could begin a new. Monuments were built to bring communities, from every part of these islands, together so all may join in entreating the sun to return to full strength, bringing light and warmth back to the land and quicken the dormant seed. When after three days it was seen that the sun had once more begun its upward journey, the joy of prayers answered was enough to let the feasting begin, hope was reborn even in the deepest of winter’s. I watch the flora and fauna in my tiny garden readying themselves for winter. The plants and trees passing the baton from summer dancers to winter sentinels and the birds change guard too with the wren and the robin taking over from the blackbirds and the starlings, while the sparrows carry on squabbling amongst themselves, seemingly oblivious to the changes in the weather. My heart always sings at seeing the robin and the wren, I feel honoured by their presence in my little space, especially the wren. The sadly persecuted wren, that was hunted and slain at solstice time, yet always honoured with being the royalty of the bird realm. Thankfully the times are gone when groups of men went out to hunt her down and beat her to death with a cudgel, it seems like a terrible thing to do to a tiny bird, but it always echoes for me a history of her importance and an association with the power of winter over the sun, particularly in the story of how the tiny wren bests the great eagle to become king of the birds . In this story the swallows, on returning from Africa, tell of how that country has a king of birds and all the birds in Britain decide that they too should have a king. The decision comes down to which bird can fly the highest and everyone believes that the eagle will win due to his great size and skill in flight. All of the birds fly as high and fast as they can, but the eagle climbs higher and faster leaving all the others to all drop away, exhausted. However the eagle is bested by the clever wren, who has been hiding in the eagle’s feathers all the while. The wren keeps still and quiet until he feels the eagle begin to tire and knows he has flown as high as he can, where upon the wren emerges from his hiding place to fly just above the eagle’s head to win the competition. I wonder just how ancient is this story? It seems to me that as an allegory of winter besting summer, it could be ancient indeed. The eagle is a sun bird, it represents the might of the sun and of great spirit in many cultures, and the wren is a small, clever and resourceful bird most obvious in winter. And why the wren and not the robin who has associations with death and is most obvious at winter time? The wren was associated with the druids, so would there have been a conflict of cultures with the coming of christianity? Could killing the wren at solstice time mean you overthrow the power of the druids? Or is it simply that, with the wren’s association with the winter, it became an obvious thing to kill the wren and hasten the revival of the sun? What power was seen to be held in that tiny body, there also seems to be a large element of the sacrificial king inherent in these story? There is also much Irish folklore about a female antagonist that lures men to their deaths and who changes her form into a wren to escape capture associated with the hunting of the wren, so who really knows? This year I have put my musings and my love of the wren into a new piece of artwork. I have worked an image in silver that, for me, honours the wren and tries, in a small way, to apologise for her mistreatment. She proudly wears her crown and carries a piece of mistletoe, the druids All Heal, a symbol of peace, new life, rebirth and regeneration. 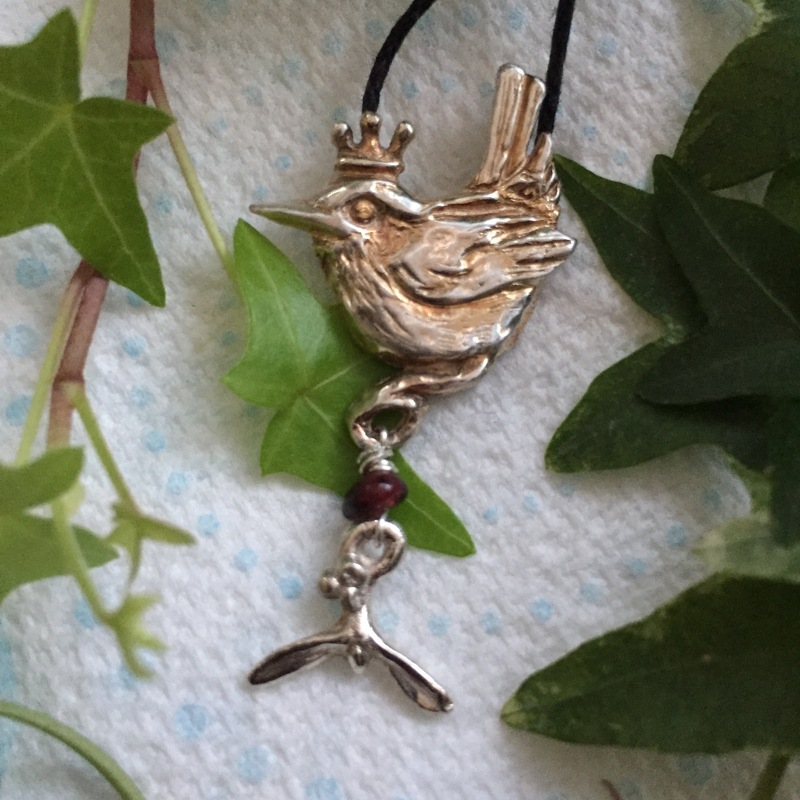 I would love the power of the tiny wren to be a symbol of peace, healing and forgiveness in a dark and complicated time, and, rather than hunting her in the flesh this solstice, I want to promote her image as a symbol of new life and love in the world. However you honour the energy of this festive season, have a fabulous time, may the energy of the sun’s rebirth and renewal bless your home and family. Beautifully said Cerri. What a lovely tribute to Winter Solstice. Oh Ceri, I love your art and your writing so very much. You are a beacon of light for us Pagans. But, please, if you will, change your background on your page to a lighter color. It is so hard for the visually impaired to read. I have cataracts that just hate a black background or pale print. I feel a special kinship tp you through your beautiful writing and I don’t want to miss a word. Thanks, dear one. Cerri, I think Kathy will like the larger and brighter font, wow it really jumps out at you now. Cerri I listened to your Lughasadh story and loved it. I could listen to you or Damh’s storytelling all day, you both have such a talent for it. I am still hoping the pair of you will do a book of the old stories in your own words. I’ve heard your story telling (Michigan Pagan Fest) and it is worthy of sharing with our adult children and soon to be grandchildren. My daughter and I enjoyed it so much. I’m so glad and I shall look forward to it. I would love to purchase both books and audio cd’s. This is wonderful news! Oh yes, love your new wren pendant, Cerri! I never knew they killed wrens over there. It must have important to the killers to expend so much energy at a hard time of year, even if we can’t understand why they did it. I think my favorite description of Yule in the UK comes from The Sword in Stone by T. H. White. I love that book not only for the shamanistic learning the Wart does, but for the wonderful descriptions of life in those days, if only as White envisioned it. Loverly Ceri. The wren is my favourite bird next to the robin. A bird of Taranis one of the Gods that reputedly required a blood sacrifice apparently. The robin, bird of the Crone or Cailleach. Its a lovely piece of jewelry work, worthy of the season.